PARAMUS, N.J. (OCTOBER 16, 2017) – The retail vacancy rate has decreased by nearly 1% since last years survey done in July 2016, according to the results of The Goldstein Group’s survey of 22 retail corridors in Northern and Central New Jersey. The survey, the most extensive retail vacancy report for New Jersey, totals over 4,250 properties and over 100 million square feet of retail space. The retail vacancy rate is now at 6.6 percent. Retailers – both existing and new, coming to New Jersey for the first time – continue to lease retail space at a steady pace. 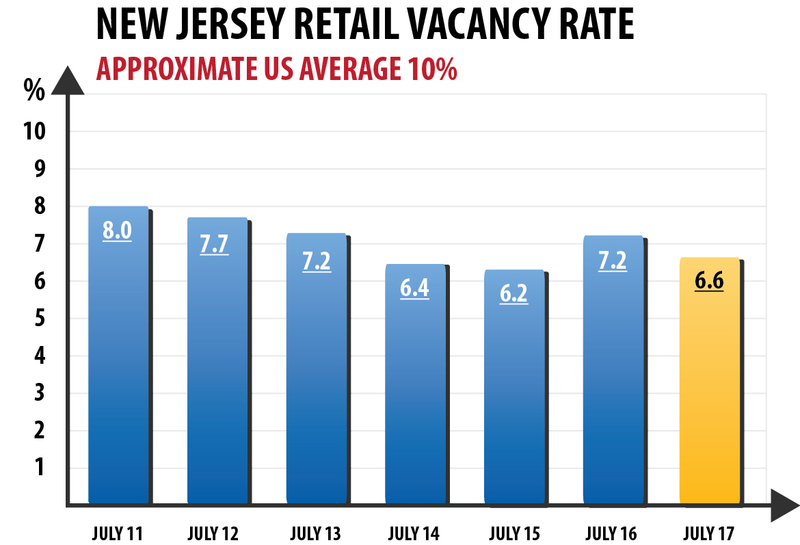 New Jersey is still doing better in filling retail spaces, compared to the rest of the United States, where vacancies still average closer to 10% nationwide. In New Jersey, supermarket activity has been very strong, as new supermarkets are opening up, and others are in the planning stages. Restaurants have been very active, many expanding their units due to the success of their prior New Jersey locations. Urgent care facilities and other types of medical services continue to expand, and numerous types of furniture and home furnishings accessory stores are either expanding or coming to the New Jersey marketplace for the first time. Entertainment concepts, notably trampoline centers, indoor sky diving facilities, restaurant and entertainment facilities such as Dave & Busters are coming to New Jersey in a big way. Top Golf opened in Edison this year. Sky Zone has opened additional locations. I Fly will open in Paramus next year, and there are gun and pistol ranges planned in Union, Wayne and Woodland Park within the next 12 months. And of course, the ultimate in entertainment centers, the opening of the Meadowlands American Dream complex, which is now slated to open its doors as it heads toward its completion in the spring of 2019. Leasing velocity in this current report totaled over 2.7 million square feet. Additionally, there’s over 1 million square feet of space currently being built and other projects in the planning stages throughout various communities in New Jersey including Paramus, Rochelle Park/Rutherford, Totowa/Fairfield, Wayne/Butler, Livingston/East Hanover, Morris Plains/Ledgewood, Montville/Rockaway, Union/Springfield, Scotch Plains/Bridgewater, North Brunswick/Lawrence Township, East Brunswick, Sayreville/Howell, Shrewsbury/Ocean, and Brick. Although the retail market has substantially improved from the recession that hit in 2008 and 2009, we still continue to see vacant space due to closings of Radio Shack, K-Mart, Macaroni Grill, Payless, Ruby Tuesday, Sears, and Staples. We’re also seeing banks such as Capital One, Wells Fargo, and Valley National Bank announce closings of branches. The majority of leasing activity continues to be driven by retailers opening small stores in the under 5,000 square feet range. 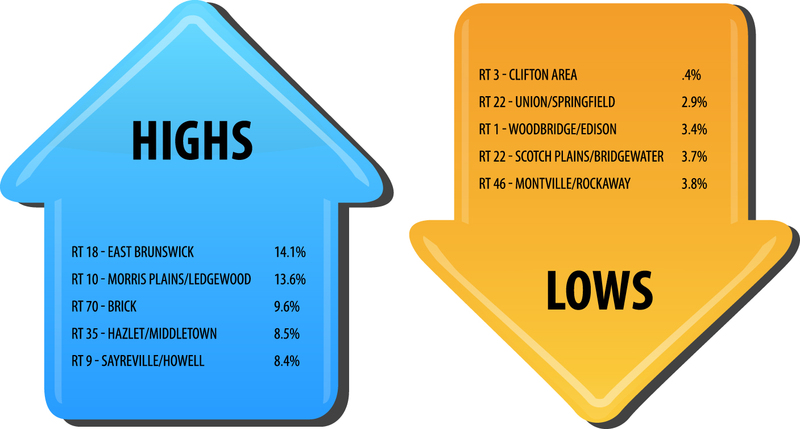 However, there was a continued spike in big box retailers taking advantage of favorable market conditions and rental rates, especially those who have filled or are looking to fill the A&P, Pathmark and Sports Authority locations that closed in 2016. Aldi in Bloomfield, East Brunswick, Freehold, Neptune, Old Bridge & Hackensack, Bob’s Discount Furniture in Union, Burlington Coat Factory in East Brunswick, Clifton, Garfield & Newark, Hmart in Paramus, DSW in Brick, East Brunswick & Holmdel, Floor & Décor in Paramus, Hobby Lobby in Springfield & Holmdel, Home Goods in Hanover, Shrewsbury & East Brunswick, Lidl in Garfield, Hazlet, Eatontown, Union, Mantua, Lacey, Hazlet, Lawrence, Burlington Township, Millville, Ocean City, Vineland & Hanover, Marshalls in Paramus, Michaels in Brick, Raymour & Flannigan in East Hanover, Riverdale & East Brunswick, The Tile Shop in Oakhurst, Trader Joe’s in Hoboken & North Brunswick, Target in Parsippany & Closter, Wegmans in Hanover, Montvale, & Middletown, and Whole Foods in Bridgewater, Closter & Newark. Many of the retailers we are so familiar with continue to expand their presence in New Jersey. Those who have recently opened locations or plan to open include: 7-Eleven in East Rutherford, Paterson, Rochelle Park & River Edge, Advance Auto in Ledgewood & Freehold, CVS in Clifton, Eatontown, Metuchen, Parsippany & Westfield, Dollar General in Garfield, Elizabeth, Plainfield, Toms River, Bayone & Belmar, GNC in Teterboro, Planet Fitness in Clinton, East Hanover, Newark, Wayne, Fairfiled & Fairview, Quick Chek in Butler, Hanover, Garfield, Toms River, Somerville, North Brunswick, Monroe & Wayne, Sherwin Williams in East Windsor, North Brunswick & Oakland, Walgreens in Irvington, Millburn & Paterson, and Wawa in Sayreville, Maplewood, Fairfield & Lakewood. New Jersey’s long list of restaurant choices and eating establishments continues to grow as new restaurant concepts and established ones have opened or announced planned openings. Blaze Pizza in Teterboro and Livingston, Chipotle in Closter, Hackensack, Morris Plains, Bloomfield, Teterboro, Watchung & Bloomfield, Buffalo Wild Wings in Flemington, Princeton & Marlboro, Five Guys in East Brunswick, Halal Guys in Union & Teterboro, IHOP in Hanover, Longhorn Steakhouse in Springfield, McDonald’s in Newark, Panera in Teterboro, North Brunswick & Wall, Popeye’s in Howell, Jersey City, Newark, Rockaway, Tinton Falls, Haledon & Toms River, Playa Bowls in Millburn, Brick, Montclair, Red Bank & Ridgewood, Shake Shack in Wayne and Livingston, Starbucks in East Brunswick, Hanover, Mahwah, Parsippany, Rochelle Park & Edison, Taco Bell in Newark, White Castle in South Brunswick and Zin Burger in Edison & Jersey City. The fast casual dining segment, which includes restaurants such as Chipotle, B Good, Shake Shack, Habit Burger, Buffalo Wild Wings, Qdoba, Blaze Pizza and Smash Burger will continue to expand throughout the state. People enjoy the fast service along with the much higher food quality and healthier food choices that fast casual provides in comparison to fast food, and as a result, fast casual dining is flourishing. Fast Food operations are not taking all this competition lightly and just lying down. Fast food operators are improving on the quality of their menus and more recently are making big efforts in reconfiguring their stores to make them more comfortable, user-friendly, and appealing to the younger crowd looking to eat quickly and get out. We’re also seeing some unique and specialty dessert food operations opening for the first time. Vanillamore, a specialty café and dessert shop, recently opened up in Montclair. Health and Wellness industry retailers continue to flourish in the Garden State. 24 Hour Fitness in Hanover & Ramsey, CKO Kickboxing in East Hanover, Crunch in Franklin Township, Club Metro in Old Bridge, Club Pilates in Westfield, Ramsey, Short Hills & Wyckoff, Fit 26 in Waldwick, Livingston & Midland Park, LA Fitness in Clifton, KoKo Fit Club in West Caldwell, and Cycle Bar in Livingston. Medical storefronts continue to flourish. City MD, AFC Urgent Care, MedExpress, Kinderpeds Pediatric Care, and PM Pediatrics and others continue to open new locations throughout New Jersey. “New kids on the block” include numerous retailers and restaurants that have decided to come to New Jersey for the first time to get into its very lucrative marketplace. Chopt, Elevation Burger, The Green Turtle, Homesense, Design Within Reach, Pie Five Pizza, Sierra Trading Post, Which Wich, Wok the Walk, Hurricane BTW, At Home, Zoup, and Goldfish Swim School all have either opened or will soon open New Jersey locations. The ever-changing and expanding supermarket business in New Jersey continues to be very compelling. It’s been over three years since A&P and Pathmark closed their doors and the impact on New Jersey food shopping continues to evolve. New operations like Uncle Giuseppe’s in Ramsey or the continuing expansion of HMart, which will be opening a Paramus store in 2018, The Gourmet Market opening in Paramus, and 99 Ranch which opened in Edison and Hackensack, are all taking advantage of the opportunities in northern and central New Jersey. They’re competing with the likes of Shop Rite, Stop & Shop and Acme. The much-anticipated openings of the two Wegman’s in New Jersey, one in Montvale and the other in Hanover, will add greatly to the competition. European competitors Aldi and newcomer Lidl are getting ready to open up numerous stores in New Jersey within the next few years having already secured locations which will soon be under construction. Trader Joe’s hasn’t been idle either, having recently opened a store in Hoboken and of course food shoppers continue to go to Costco and other warehouse stores for their supplemental bulk food shopping. Leasing activity in the Garden State the past 12 months is still quite brisk and a lot of the quality space is being leased. This is especially true in the stores sizes 10,000 sf feet and under. Many restaurant and traditional retailers are taking quality space when they can grab it. We anticipate seeing the vacancy rate improve going forward. New Jersey, fortunately, continues to be one of the most desired state for retailers to do business in, with all its favorable demographics.